‘Bamboo Coral’ is an ocean coral, and has replaced the more precious ‘red coral’ in jewelry design due to the ‘red coral’s’ depletion. Naturally creamy-white or gray ~ when bamboo coral is dyed red to mimic the more precious red coral, it can be difficult to distinguish between the two. Bamboo coral is injected with red dye to saturate it throughout. After the bamboo coral has been hand cut into the desired shape — usually a bead — the dyeing process takes place. Once dyed and sanded, the coral bead is then coated with a resin base and polished to achieve the high gloss finish found in jewelry. 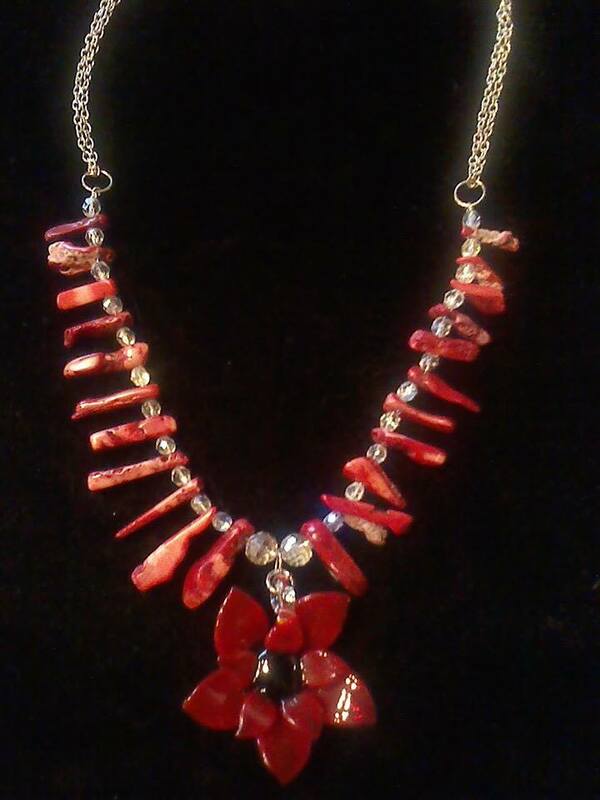 I love using bamboo-coral in my designs, because of it’s rich color, and smooth appearance. Plus, knowing that I’m not contributing to the extinction of a beautiful ocean-creation makes it definitely more enjoyable. 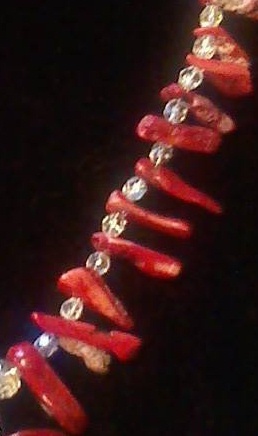 In my latest design I paired the gorgeous bamboo-coral beads with faceted, clear czech beads, that catch the light beautifully and, due to a special coating, reflect it in varying colors. The final touch is the flower pendant. It mirrors the deep red color of the beads, and is a beautiful piece of glass-art. If you love ‘bamboo coral’ and decide to own a piece found in the ‘Garden of the Sea’ please note that bamboo coral is naturally soft and porous, so please keep your coral jewelry away from perfumes and hairsprays to avoid damage. So, here I was. 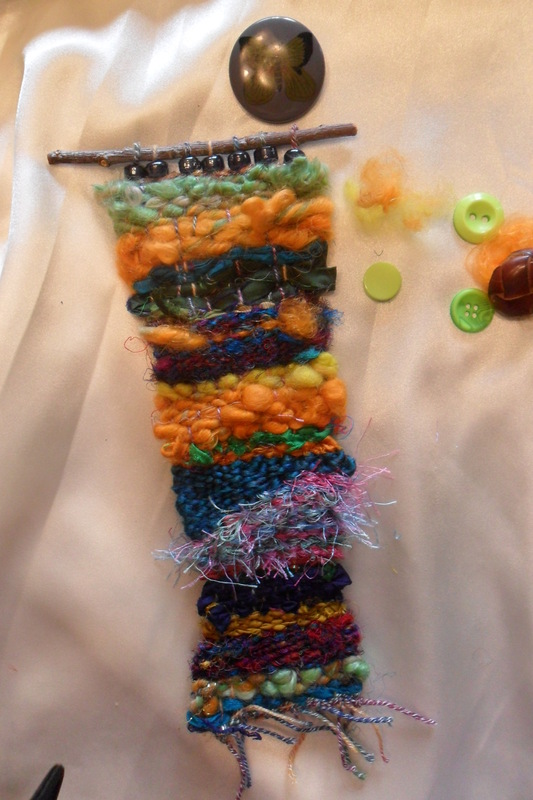 With a semi-finished piece of a woven textile, planning the finishing touches. I picked out some beads (of course! 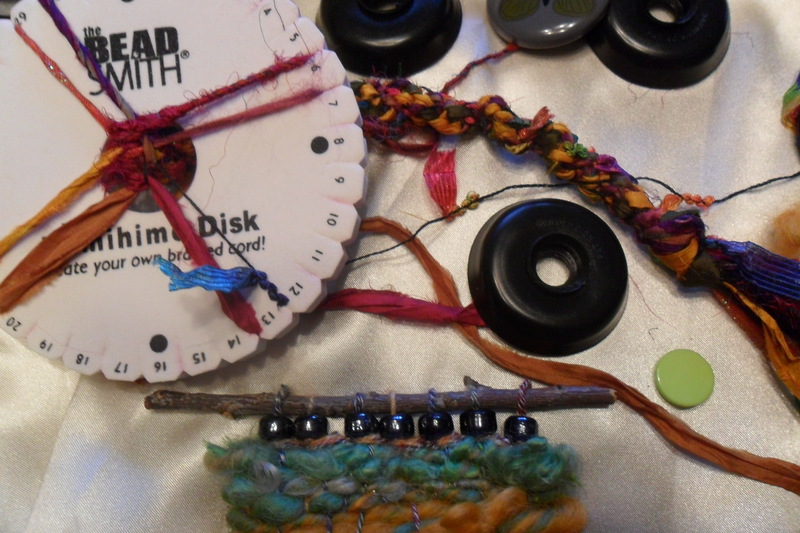 ), buttons, yarn. I walked through the yard, eying every little twig, judging it for it’s potential to become part of my creation. 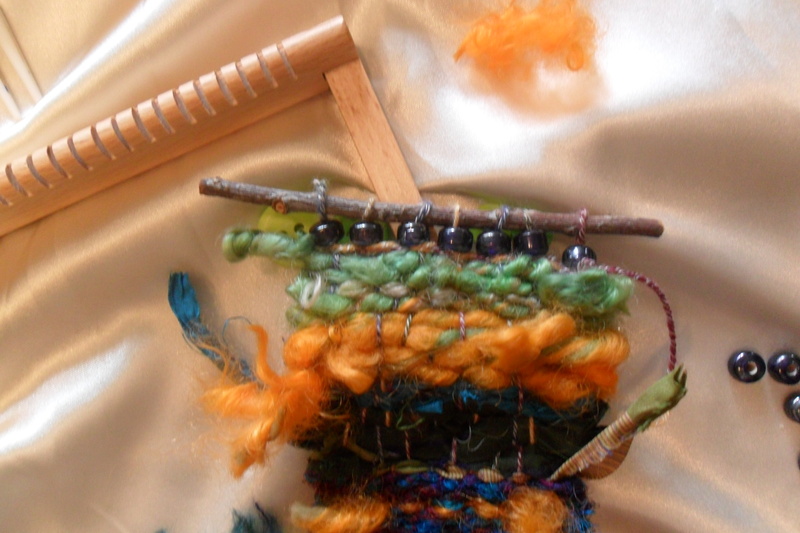 I decided to use a twig to complement the natural fiber I used. I wanted to knot the loops to make sure nothing would unravel in the years to come. The little loops were just that, little – as in, too short. 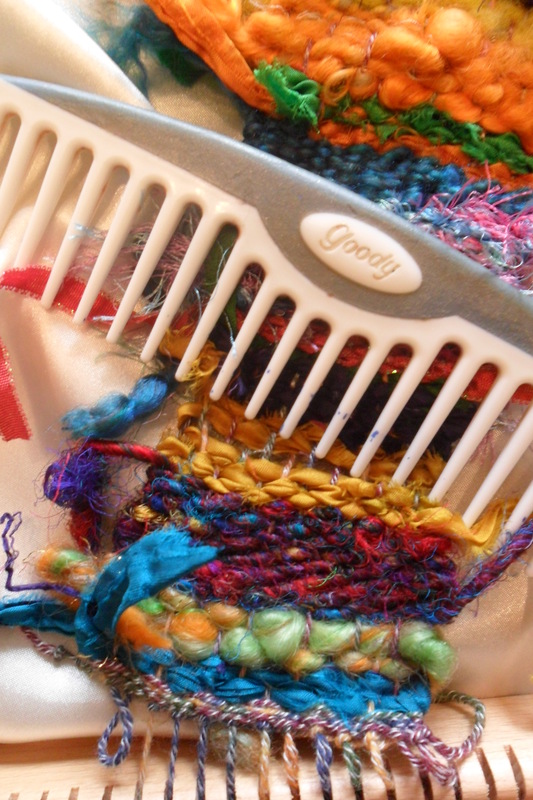 So I took my wide-tooth comb, and row by row compressed the weaving. You might notice that the piece is shorter now, than it was in the previous picture. Now I had enough length to work with. I knotted the loops, and threaded a wide-hole bead on each one. Time for my little twig. 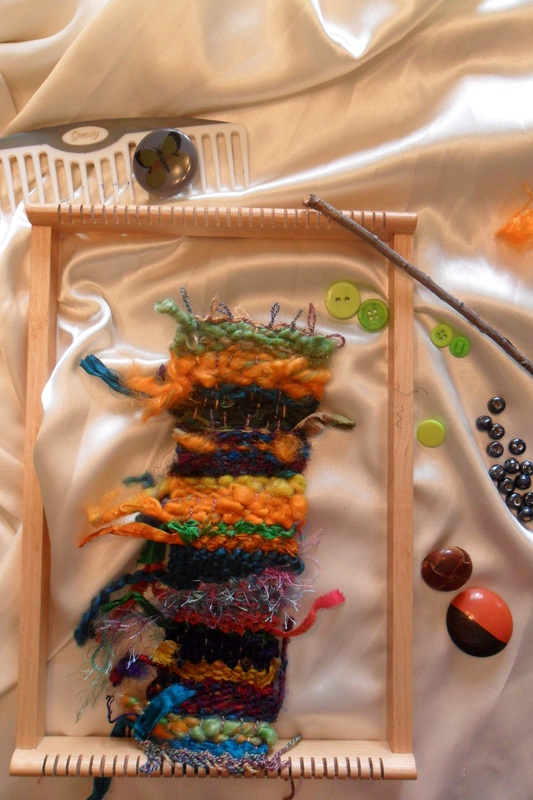 Loop by loop the piece of weaving became a wall-hanging. My plan was to unhook the bottom portion, cut the loops ~ aargh, scissors! But, as you can see, it ended well 😉 ~ and knot the warp to create a fringe. As you can clearly see, ‘Fringe’ is not the right word for the wimpy strands, sticking up ever which way. 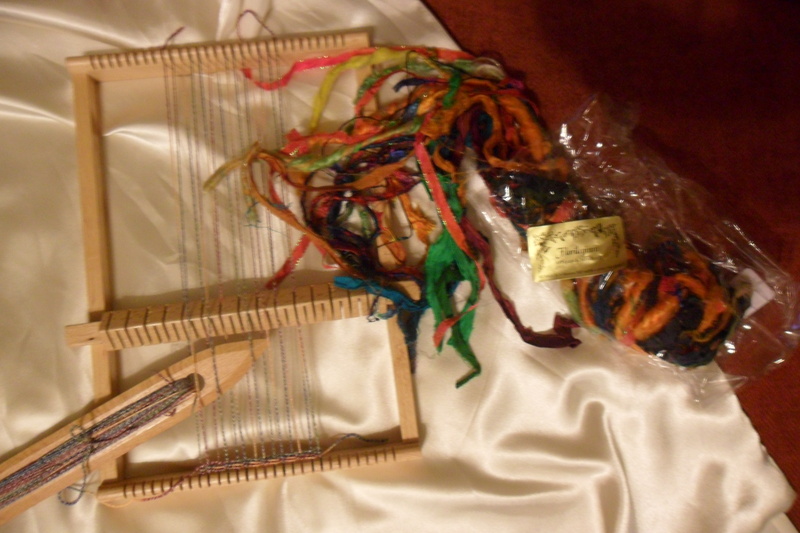 But – fret not – I still had some beautiful yarn left. So – now the ‘Fringe’ deserves it’s name! I played with the buttons, until I was happy with the look. A few stitches and they were securely in place! Now – how to hang it up? I don’t just want to hook the twig on a nail. Out came the ‘Kumihimo’ Disk. 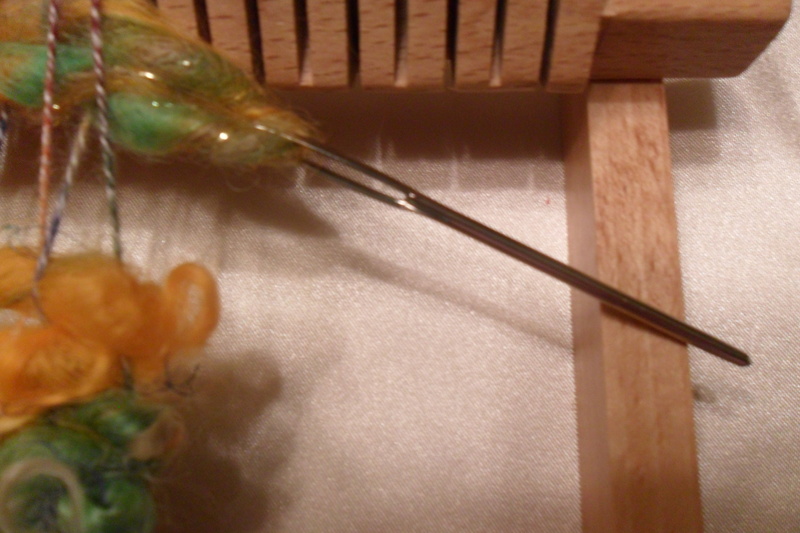 Believe it or not, I still had some silk-yarn and -ribbon left. I picked some additional yarn from my stash, and made this pretty cord. Thanks for sticking with me ’til the end. I hope you enjoyed the ride! 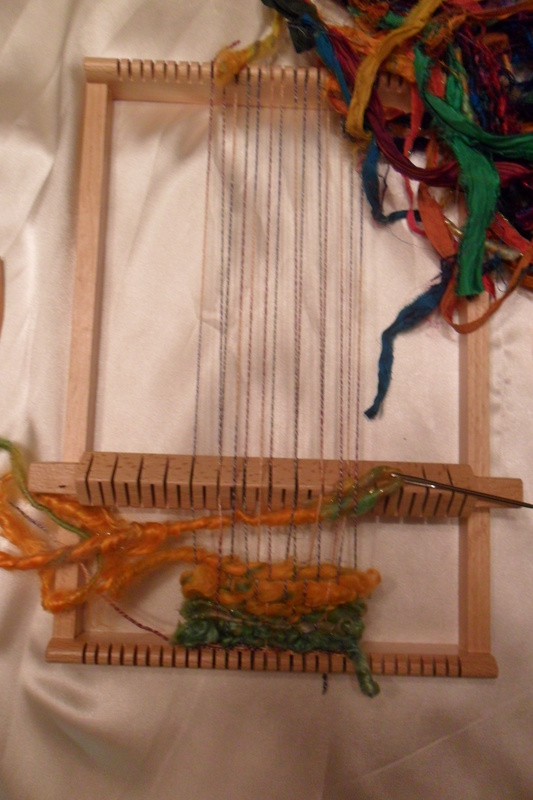 I knew I had to create the warp onto the frame – so I picked a pretty yarn and did just that (a little tip – don’t use stretchy yarn! I did that, and, boy, did that make the process harder!) Silk and cotton works best! 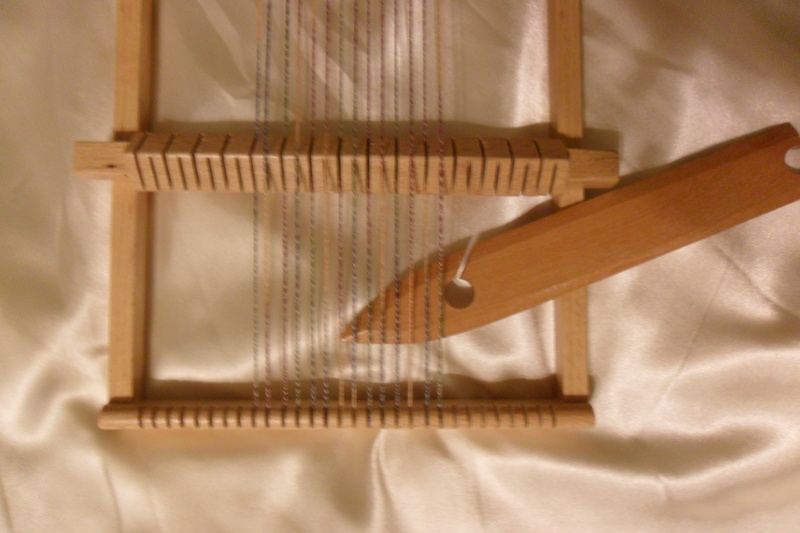 I fitted the ‘Heald Shaft Gear’ under the warp, and let the yarn (1st, 3rd, 5th strand, etc.) fall into the slots. The yarn needed a little assistance – but, still not hard! 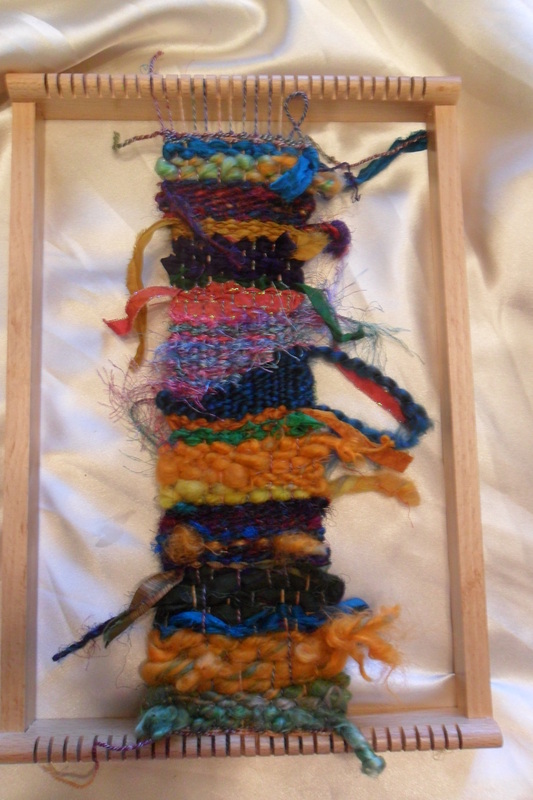 Finally I got to weave! After each row, the Shaft needs to be turned one fourth forward, so the 2nd, 4th, 6th Strand etc. falls into the slots. Easy-peasy! I wove 5 or 6 rows with the yarn for the border. By then I had an inkling of an idea why it was suggested to me NOT to use stretchy yarn! See, the yarn stretches, but doesn’t bounce back. Making it harder and harder to do the over/under motion of the needle. But, I wasn’t about to give up, and start over. I kept going, vowing to use cotton the next time. 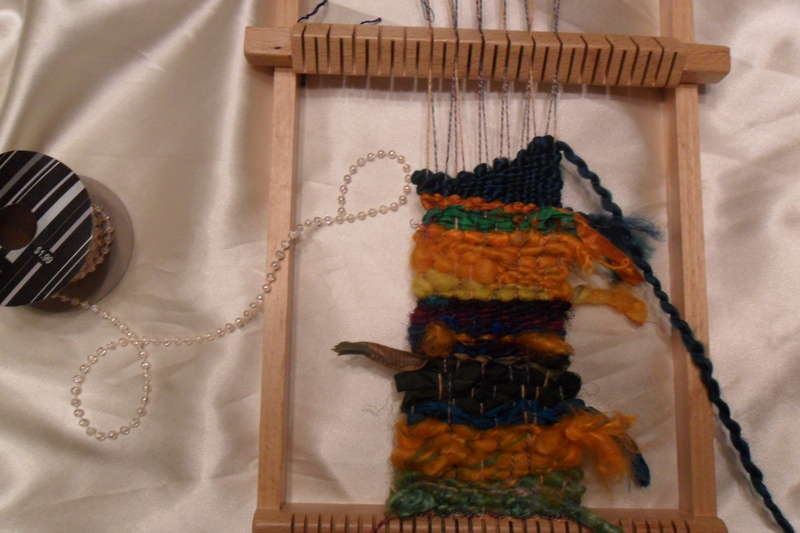 Now it was time to pick strands of yarn, and ribbon for the actual ‘decorative’ part of my piece. In my favorite store (Florilegium in Weston) I found bags with a variety of silk yarn and different ribbons. Perfect for my little project! 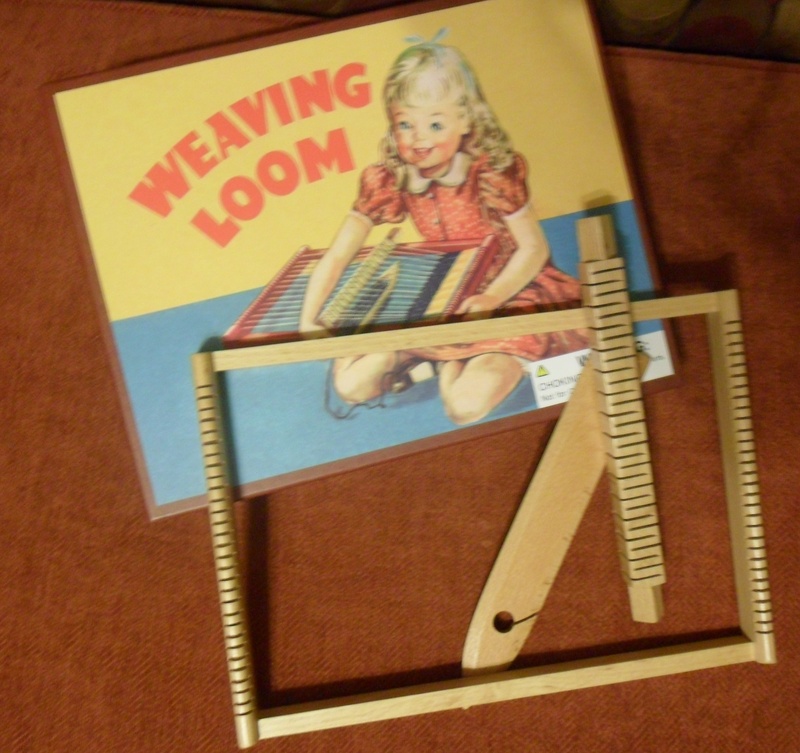 Since the loom only came with one shuttle needle, and I didn’t feel like winding/unwinding the yarn every few rows, I went and got out my tapestry needle – and, since it’s a narrow piece, found that this was ideal! And on and on I went – then I got fancy! I started a simple ‘design’ – by weaving to the middle, turning around, going back weaving to one warp before the last, and so on. 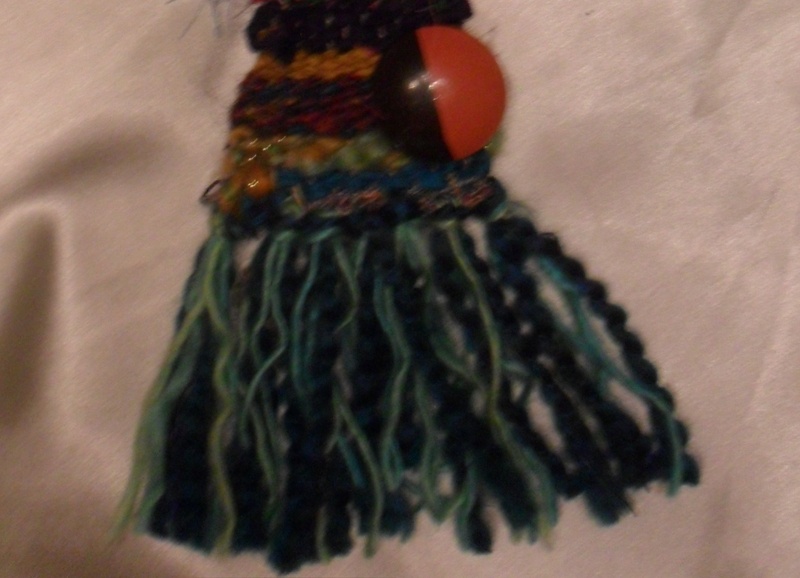 Then I did the same thing, with a different yarn, from the other side. Et voilá – two triangles! I’ll be back soon to show you the final result! I hope you enjoyed following my process! 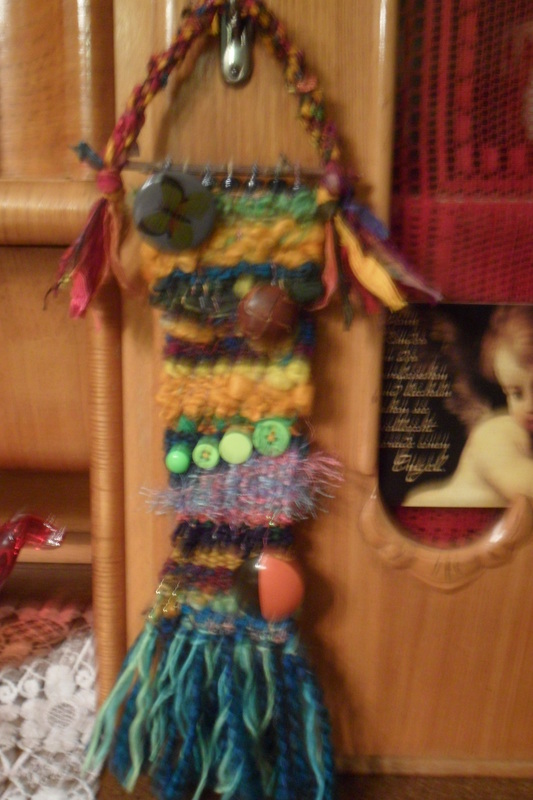 Let me know if I inspired (and maybe helped) you with your own little wall hanging! I love this! 🙂 I’m currently making a beaded curtain – a long way away from this beauty! Hello and ‘Welcome’ to my blog! Thanks for stopping in, reading. I hope you enjoy my pictures, thoughts, and writings ~ it’s going to be a fun ride! Since we’re lucky enough here in Kansas to enjoy spring~like weather from now until … well, at least for 10 days, then we’ll see … I brought out the sewing machine and made some nice and cool cotton ‘Infinity Scarves’. They embellish every outfit, keep the (sometimes) cool breeze from chilling you to the bone, are reversible, and – of course – machine washable!